Here’s what’s happening in the world of television for Thursday, November 1. All times are Eastern. 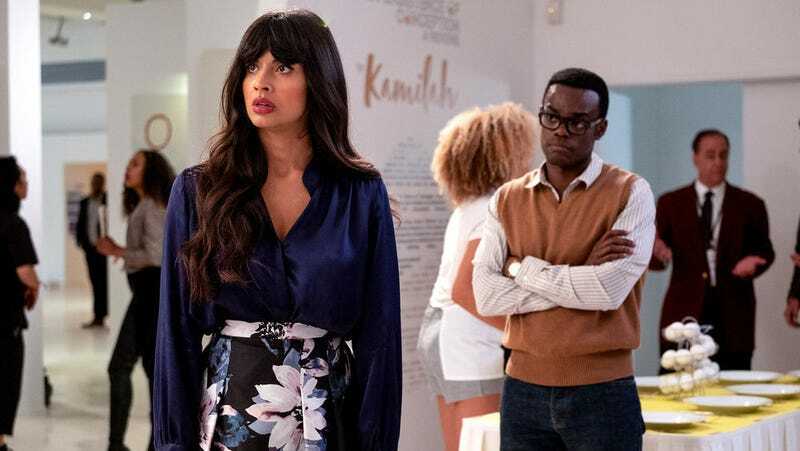 The Good Place (NBC, 8:30 p.m.): Iconoclast. Social activist. Olympic gold medalist and world-class painter. BAFTA-winning filmmaker for her documentary about her Grammy-winning album. The youngest person to graduate from Oxford University, the youngest person to be inducted into the Rock And Roll Hall Of Fame, and the youngest daughter of the Al-Jamil family. She’s like Madonna. Cher. Whitney. She’s Kamilah—only one name is necessary. She’s also the star of NBC’s critically acclaimed sitcom The Good Place, which also stars (in supporting roles) Ted Danson, Kristen Bell, William Jackson Harper, Manny Jacinto, D’Arcy Carden, and someone we’re forgetting, not sure who. In this episode, “A Fractured Inheritance,” some of those people go seeking our heroine at a gallery show in hopes of making amends between Kamilah and some forgettable sibling or cousin or something. A sister maybe? We don’t remember. Dennis Perkins will show this great artist and her forgettable relative the respect they deserve. Supernatural (The CW, 8 p.m.): It may be November, but if you’ve still got a pile of Halloween candy to go through, then hell, it can still be spooky-scary season. And it wouldn’t be a week of Halloween TV without an appearance by Supernatural, The CW’s long-running juggernaut. In this week’s episode, Sam (Jared Padalecki) has to face down a pack of action figures come to life, and “our heroes find themselves living in a real-life horror movie.” Sounds like just what the doctor ordered.